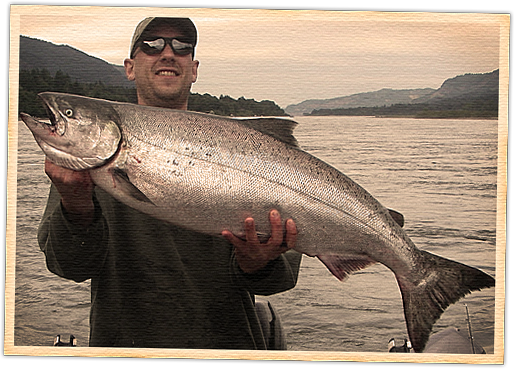 Columbia River Spring Chinook (March – May) Portland, OR – The world’s most prized eating salmon, Columbia River spring Chinook are coveted for their delicious meat high in oils containing healthy omega 3 fatty acids. Some early “Columbia springers” have an oil content as high as 22 percent, the highest of any salmon in the world. We offer guided fishing trips for these premium fish in the Portland, OR area starting in March. Our spacious 24 foot Willie “Raptor” Jet Sled can comfortably fish up to six anglers. Buoy 10 Salmon (August) Astoria, OR – August 1st is the traditional kick-off to the famous “Buoy 10” fishery at the mouth of the Columbia River, where 750,000 to 1.5 million salmon can pass through the estuary in just a five week period. 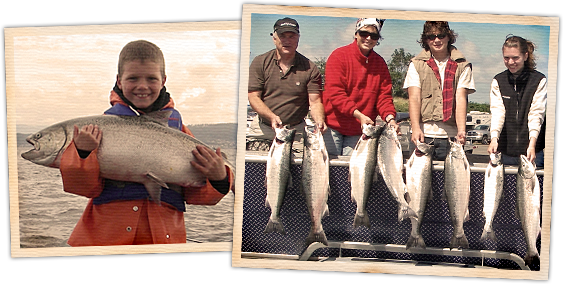 The Buoy 10 salmon fishery consists of big schools of coho (silvers) and multiple stocks of fall Chinook, the most sought after of which are the Columbia Upriver Brights. We offer daily guided fishing trips departing from Astoria, OR for these chrome bright salmon fresh from the ocean starting in August. Upriver Brights (September) Portland, OR – Join us in the Portland, OR area to catch the Columbia Upriver Bright fall Chinook as they make their way upriver. Columbia Upriver Brights are exceptionally strong swimmers that must travel over 350 miles from the ocean to reach their spawning grounds in the Hanford Reach area of the upper river. When hooked they provide a fun and exciting fight that will test even the most seasoned angler’s skills. Join us for a fun and exciting day of Columbia Upriver Bright fishing in the Portland, OR area starting in September. 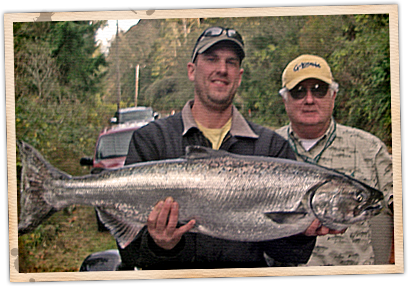 Tillamook Bay Salmon Fishing, (September – November) Oregon Coast – Tillamook Bay Fall Chinook (September – November) Tillamook, OR – 75 miles west of Portland, OR on the north Oregon coast lies a small inlet of the Pacific Ocean known as Tillamook Bay. Surrounded by the rugged coastal mountains, Oregon’s second largest estuary is home to 59 different species of fish at various times of the year. It’s the famous Tillamook Bay “hawg” fall Chinook that are most impressive, though. 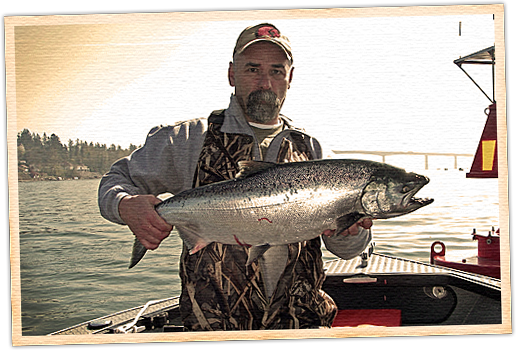 These are the largest Chinook on the west coast with a Tillamook Bay hawg capable of reaching 60 pounds. The name “Tillamook” is Native American for “Land of Many Waters” and refers to the five rivers which enter the bay. The Miami, Kilchis, Tillamook, Trask and Wilson Rivers combine for a total spawning escapement of around 25,000 fall Chinook every year. Fresh fish enter the bay starting in September and continue to stack up until the winter rains draw them up into the rivers. Join us this fall to catch huge wild Chinook on the scenic north Oregon coast. Alaska Fly-in Salmon Fishing, (June) Lake Creek, Alaska – Guided Alaska Fishing Trips All-inclusive (June) Lake Creek, Alaska – Accessible only by boat or floatplane, located 70 miles northwest of Anchorage just south of Denali Nat’l Park lies a wild and scenic river known as Lake Creek. Flowing 60 miles from its source in the foothills of Denali (Mt. McKinley), Lake Creek is an angler’s paradise. During salmon season, the mouth of Lake Creek is one of the hottest bites in all of Alaska. With its crystal clear water and freestone gravel bottom, Lake Creek provides textbook perfect salmon spawning grounds. Some call it a virtual “wild fish hatchery” with all five species of Pacific salmon returning home throughout the summer. The native rainbow trout, arctic grayling, and dolly varden are year round residents, and on top of that, the surrounding lakes are teeming with hungry northern pike. It’s the king salmon, however, that get the most attention, with thousands upon thousands of chrome bright Alaskan kings returning to Lake Creek fresh from the ocean each June. With over twenty hours of daylight each day, we travel the river by jet boat, crossing shallow riffles only inches deep in search of these premium fish. Lake Creek Kings are magnificent specimens, extremely strong fighters averaging 25 pounds with exceptional fish up to 65. The wilderness setting of Lake Creek also offers tremendous wildlife viewing opportunities including brown bear, black bear, moose, wolves, fox, beaver, otter, and bald eagles just to mention a few. Make sure to bring your camera and don’t forget a cooler to bring home your catch. 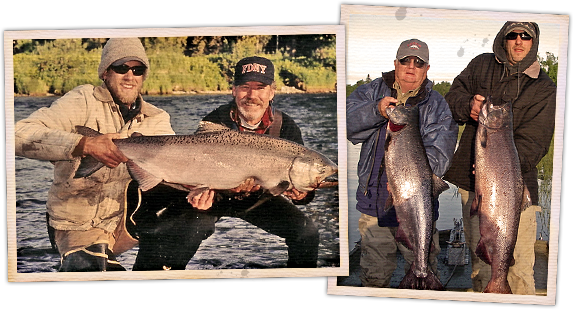 We offer all-inclusive 6 day, 5 night lodge packages with deluxe cabins, guided fishing, gourmet meals and floatplane flight from Anchorage included.